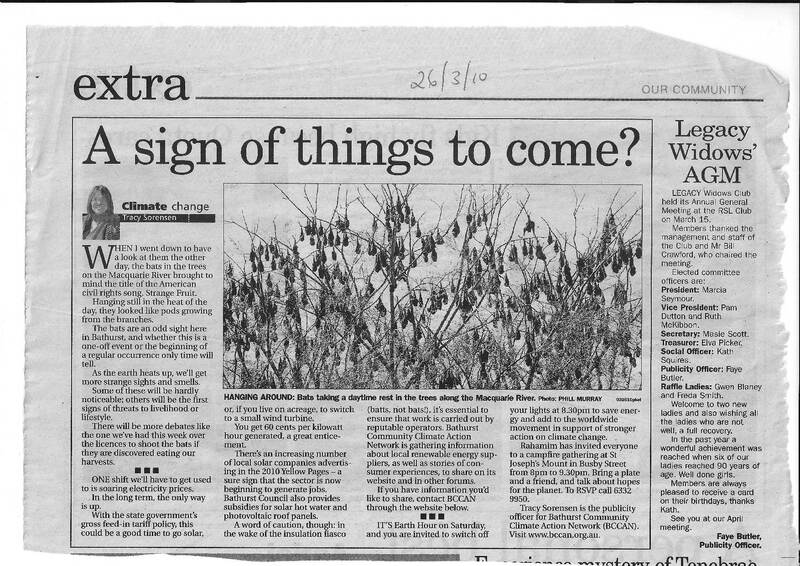 Column written for Bathurst Community Climate Action Network for Bathurst newspaper The Western Advocate published 26/3/14. When I went down to have a look at them the other day, the bats in the trees on the Macquarie River brought to mind the title of the American civil rights song, Strange Fruit. Hanging still in the heat of the day, they looked like pods growing from the branches. The bats are an odd sight here in Bathurst, and whether this is a one-off event or the beginning of a regular occurrence only time will tell. As the earth heats up, we’ll get more strange sights and smells. Some of these will be hardly noticeable; others will be the first signs of threats to livelihood or lifestyle. There will be more debates like the one we’ve had this week over the licenses to shoot the bats if they are discovered eating our harvests. One shift we’ll have to get used to is soaring electricity prices. In the long term, the only way is up. With the state government’s gross feed-in tariff policy, this could be a good time to go solar, or, if you live on acreage, to switch to a small wind turbine. You get 60 cents per kilowatt hour generated, a great enticement. There’s an increasing number of local solar companies advertising in the 2010 Yellow Pages – a sure sign that the sector is now beginning to generate jobs. Bathurst Council also provides subsidies for solar hot water and photovoltaic roof panels. A word of caution, though: in the wake of the insulation fiasco (batts, not bats! ), it’s essential to ensure that work is carried out by reputable operators. Bathurst Community Climate Action Network is gathering information about local renewable energy suppliers, as well as stories of consumer experiences, to share on its website and in other forums. If you have information you’d like to share, contact BCCAN through the website below. It’s Earth Hour on Saturday, and everyone is invited to switch off their lights at 8.30pm to save energy and add to the worldwide movement in support of stronger action on climate change. Rahamim has invited everyone to a campfire gathering at St Joseph’s Mount in Busby Street from 8pm to 9.30pm. Bring a plate and a friend, and talk about hopes for the planet. To RSVP call 6332 9950. 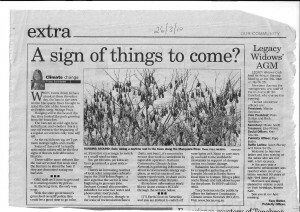 This entry was posted in Bathurst, Bathurst Community Climate Action Network on March 26, 2010 by Tracy.